I would like to be the first to welcome you to the 2015 summer field season! This is the season a lot of us marine scientists live for – the time of the year when we can shed the winter coats, leave the desktop computers behind, and go have some adventures (outside of the lab, for a change). Here at UNC, the first to embark was the Castillo Lab (follow their current field adventures in Belize @Castillocorals and @jbaumann3). 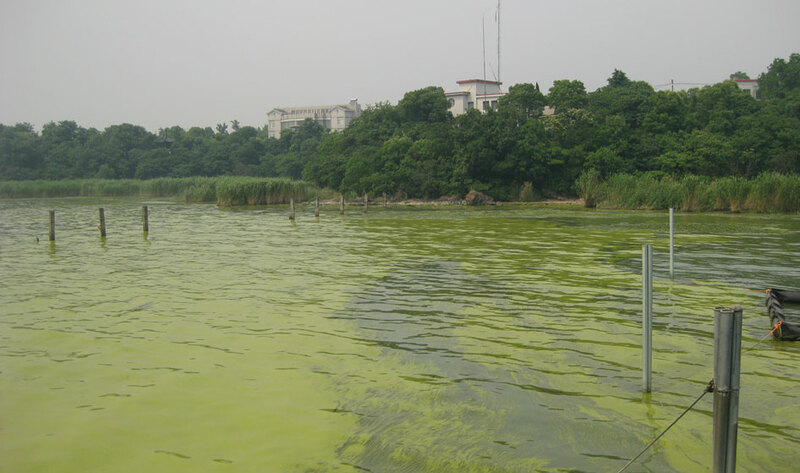 I will soon follow suit and begin on my own international research adventure to study toxic cyanobacteria blooms in Lake Taihu China with the Paerl lab (for more info: check out the lab website). While I could easily use a whole blog post to talk about what I’m actually studying (in brief: organic nitrogen – found in animal and human waste, agriculture, run-off – in freshwater systems and how this nutrient source may be used by toxic cyanobacteria – essentially little primary producers called phytoplankton that can produce a toxin harmful to humans and animals), I mainly want to talk about the logistical challenges, nervousness, and extreme excitement of conducting research in another country. Lake Taihu, China and the cyanobacteria (i.e., the green stuff in the water) that dominate the lake from summer to fall. Image from a paper by S.W. Wilhlem and G.L. Boyer. 1) Typically you have to fly there. Planes are great. They mean I can fly from coastal NC to Shanghai, China in 24 hrs. Which when your study site is literally on the other side of the world, flying in these metal tubes at hurtling speeds is necessary. But because these metal tubes are relatively small, you have to think about space, weight, and the logistics of packing. How do I get the hundreds of fragile, glass vials to Lake Taihu? What about all the filters, filtering equipment, tweezers, foil?! Will my luggage be overweight? Will I be able to pack more than two pairs of pants?! Basically, you have to be a master packer. It helps to have a scale in your lab too…. 2) And then you have to fly back…and now you’ve collected over 200 water samples and 400 filters, all of which need to stay frozen as you travel the 24 + hours (and 7 hour layover in L.A.) back to coastal North Carolina. Which means you have to be an even better master packer (and make sure you take into account the weight of water…I hope they have a scale I can use at the field station at Lake Taihu!). 3) The language ‘barrier’. I don’t speak Chinese (why, oh, why did I pick to learn Spanish in high school and college — clearly Chinese would have been the way to go). And while I’d like to think of this as less of a ‘barrier’ and more as a ‘hurtle’ (on some basic level, language and human interactions are all about body language and less about actual words, right? ), it will definitely make reading signs and communicating science a little bit more difficult (maybe I should work on my research elevator talk in Chinese?). How will I know what train to get on? What about reading the menu? What about talking with collaborators? 4) The adventures, opportunities, amazing science, and collaborations that come out of any international (or national) field adventure. I remember that I’m going to China for my job (yeah, being a marine scientist – even in training – is AWESOME). I get to experience a new city, a new country, a new culture all while doing science. I will be able to enhance collaborations with world-renowned scientists and learn about a topic (i.e., organic nitrogen) that nobody really knows about. I remember that while a million things can (and probably will) go wrong, I’ll be able to change and adapt my plan as necessary, and above all else, I will most definitely come out will some pretty awesome stories. I think (hypothesis to be tested) the key to any international field experience, is to go with the flow, change as necessary, and most importantly have fun! Can anybody out there verify this?! Stay tuned for ‘Part II’ when I get back. We’ll see how closely my expectations align with reality (spoiler alert: I have a feeling they will be widely different…). Tags: China, research, Science, travel. Bookmark the permalink. Previous post ← What is Your Marine Science Destiny?